Q. Where can I find a print (hard copy) journal in Doheny Library? Current issues of journals (designated by the "READING-RM" location in HOMER) are in the Periodicals Reading Room on the main floor of Doheny Library (in the southwest corner of the building). 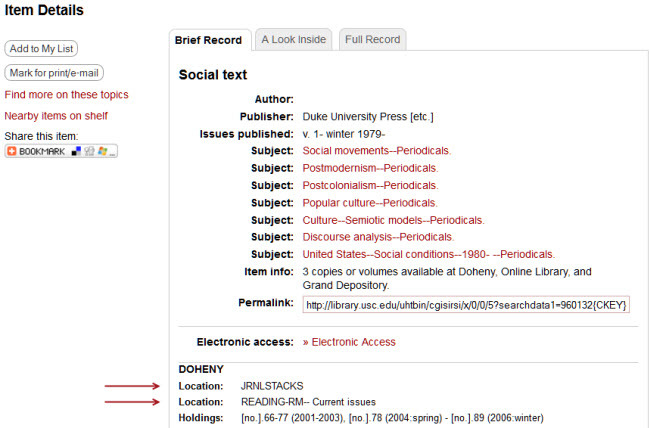 Older issues of journals (designated by the " JRNLSTACKS" location) are on stacks level 1. If you need assistance locating a journal, please ask at the Circulation Desk on the main floor.